The answer, culled from commercial canine DNA test results, underscores the potential of consumer-level data to facilitate scientific discoveries and advancements in animals. Boston-based Embark Veterinary, Inc, which provides DNA testing for dogs, has conducted a first-ever canine genome study based on commercial DNA test results. The study’s goal? Find out why huskies have blue eyes. The study, published in PLOS Genetics, was made possible because dog owners whose pets have been genetically tested through Embark Veterinary provided their dogs’ phenotype data and photos online. Although variants of 2 genes involved in determining coat color have previously been identified as the source of solid or partially blue eyes in many dogs, these variants are not present in Siberian huskies or in some Australian shepherds that have vibrant blue eyes. 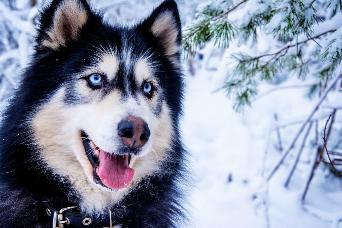 In the current study, which included 6070 genetically tested dogs, the investigators found that an area of duplication on chromosome 18 near the ALX4 gene—which is related to eye development in humans—was strongly associated with blue eye color, primarily in Siberian huskies but also in some Australian shepherds. One copy of the variant was enough to cause blue eyes or heterochromia (1 blue and 1 brown eye). Noting that some dogs with the variant had brown eyes, the investigators concluded that other genetic or environmental factors are still involved. This study, say the authors, paves the way for a host of scientific research that will not require significant funding or time because genetic data are paid for and provided voluntarily by pet owners. "It's a new way of doing dog genetic research,” said Adam Boyko, a coauthor of the study and cofounder of Embark. “Instead of an academic researcher like me needing to ask the federal government for money in order to sponsor a study on 1 particular thing, dog owners pay for the genetic testing up front, and then the genetic data can be quickly put to use by researchers investigating a whole host of different studies." The company is pursuing similar research projects on a range of morphologic and health-related traits. “We hope to continue to use our platform to move canine genetics and health forward in a very real way," said Aaron Sams, senior scientist at Embark and another study coauthor.